Navajo Rug Auction get ready! 10th Annual Navajo rug auction, get ready! I have noticed in my contacts with the buying public that the most important determinant of a sale is the initial impact a rug makes on the customer. A rug’s size, design and color combine to produce a reaction in the buyer that seems to make him cry out: “I must have this rug!” There is no accounting for taste, and while I would be the last to ad- vise you to buy a rug that did not appeal to you aesthetically, I would point out that there are a few helpful rules to carry into the rug buying game. These guides will aid you in making an intelligent decision. While beauty is an intangible, quality is not. • Rule number 1: Always open up the rug being considered to its full width and length on the sales room floor. Never buy a rug of which you’ve seen only a half or a quarter—the folded under portion may contain serious flaws. You’ll want to make sure the rug does not have built-in wrinkles. Besides, you’ll want to get the rug’s full visual effect. • Rule number 2: Carefully check the weave. Does the design have the same width at one end of the rug as it has at the other? Are the horizontal and vertical lines straight as well as uniform in width? Is the tightness of the weave uniform throughout the rug? Are the warp threads out of sight as they should be? No rug should or would be 100 percent perfect. Then it would look as • though it were machine made and lose the charm of a hand made piece. • Rule number 3: Smoothness is an important consideration. The rug thickness should be the same throughout, with no “thin” area in a “thick” rug and vice versa. • Rule number 4: Color uniformity. A rug may suffer when a weaver is careless in dyeing her yarn. Only a relatively small amount of yarn is dyed at a time, just what she thinks will be suffi- cient for her rug. So, sometimes when she has to dye more for her rug, she will get marked variations in what is supposed to be a single hue. White is another color stumbling block. When wool is improperly scoured, the white will be traced with black. Dry cleaning will not remove these streaks. You should be prepared to pay more for quality weaving—but in the long run, you will not regret it. Navajo rugs are just one of a kind. If you like a rug and the price is right—buy it. Don’t depend on the rug waiting for your return. The Navajo rug can be classified by nine different weave patterns: the plain weave, the diagonal twill, five types of diamond twills, two-faced, and double cloth. Each of these weave patterns has its own form of heddle loom and heddle manipulation. It is important to note that each weave is made on its own unique heddle loom: no two weaves are made on the same loom (Amsden, 1949). The Plain Weave: It is considered the first weave adapted to be made on a heddle loom. It is one of the simplest weaves, using small even stitching with a featureless surface. The featureless surface enables the artist to produce a smooth rug texture in which the artist can create elaborate patterns. Since this weave only uses two sheds (temporary separation between between upper and lower warp yarns), the yarn does not alternate, resulting in a fabric of vertical ribs or lines. The Diagonal Twill Weave: Twilling is described as a constant diagonal progression of stitches produced by lateral threads of yarn (Amsden, 1949). This form of weave using four sheds, resulting in the production of diagonal ribs or lines. The diagonal twill is most commonly seen in patterns of plain stripes or bands with differing widths. Diamond Twill Weaves: This weave is created with the use of three different color warps. It is a solid mosaic of diamond-within-diamond pattern. Each diamond will be a different color from the ones that enclose it. The weaver will use a basic arrangement, alternating stitches. The heddle arrangement will send diagonal ribs or lines outward in opposite directions from a common center, which will produce a series of V’s with the point downward. A reverse of the heddle order will then be used to produce the top or cap of the V with the point upward, resulting in the figure of a diamond. However, it is not uncommon to see a pattern in which the top portion of the V design is not created. The outcome of this pattern will be a repetition of V-inside-V in vertical rows (Amsden, 1949). Two-Faced Weave: This weave is created with the use of four sheds in which the end result is a pattern with vertical ribs similar to the plain weave, but includes the use of stitches of irregular width. 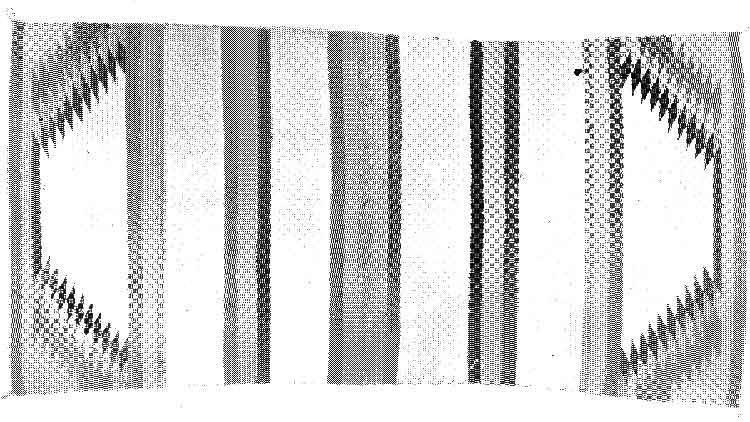 The heddle manipulation for this weave pattern results in three-fourths of the total weft color to the rear of the rug, leaving only one-fourth of the color visible in the front of the rug (Amsden, 1949). In a typical two-faced weave, the artist will have a simple pattern of stripes in the rear, while making a figured pattern on the front of the rug. Hence, the term two-faced was given to this type of weave. 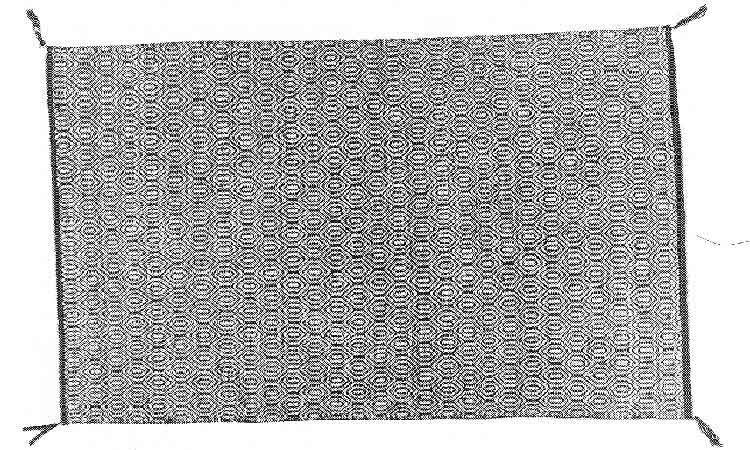 Double Cloth Weave: This weave is described as a reversible fabric requiring two sets of warps arranged one above the other, each with its own weft. It is common for the sets of warps to be of different colors. The reverse-side warps are raided to replace surface side warps, which are lowered. Colors are exchanged and ties are formed between otherwise separate portions of the fabric. With each set of warps crossed by its own weft of similar color, the result is a design with strongly contrasting colors (Amsden, 1949). 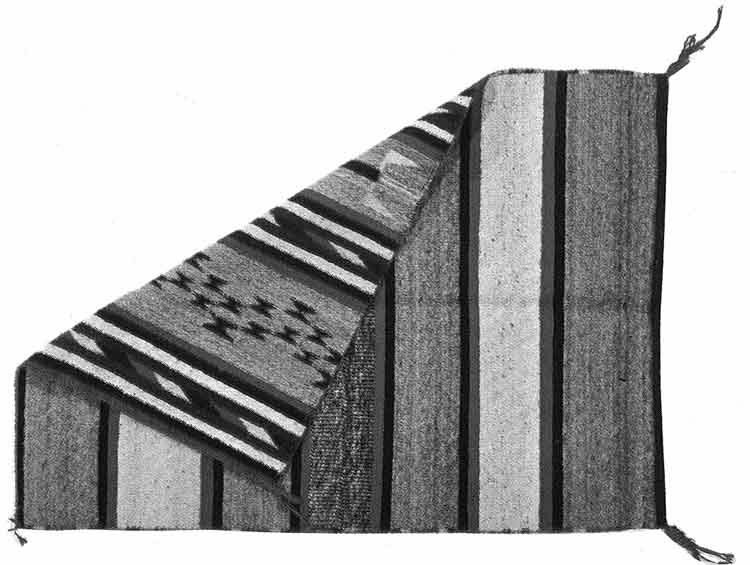 Maxwell, Gilbert S. (1963) Navajo Rugs: past, present & future. Desert Southwest Inc.
Amsden, C. A. (1949). Navaho Weaving: Its Technic and History. The University of New Mexico Press. NAVAJO RUGS -past, present, & future- by Gilbert S. Maxwell In collaboration with Eugene L. Conrotto © 1963 Desert-Southwest, Inc.
No two Navajo rugs are exactly alike; however, even the budding expert can trace (usually at a glance) many rugs to their place of origin. This is possible because certain trading post centers produce rugs of distinctive style, pattern and color. You need not be an architect to know that a shingled white frame house with shuttered windows and a sharp-pitched roof belongs to Cape Cod, not in a Los Angeles suburb. By the same token, you need not be a Navajo textile expert to know that black, white, gray and brown geo- metrically-designed rugs are woven in the Two Grey Hills area (and in the rug fancier’s jargon, are known simply as “Two Grey Hills”). The Reservation can be divided into 13 weaving regions, each producing a characteristic rug. 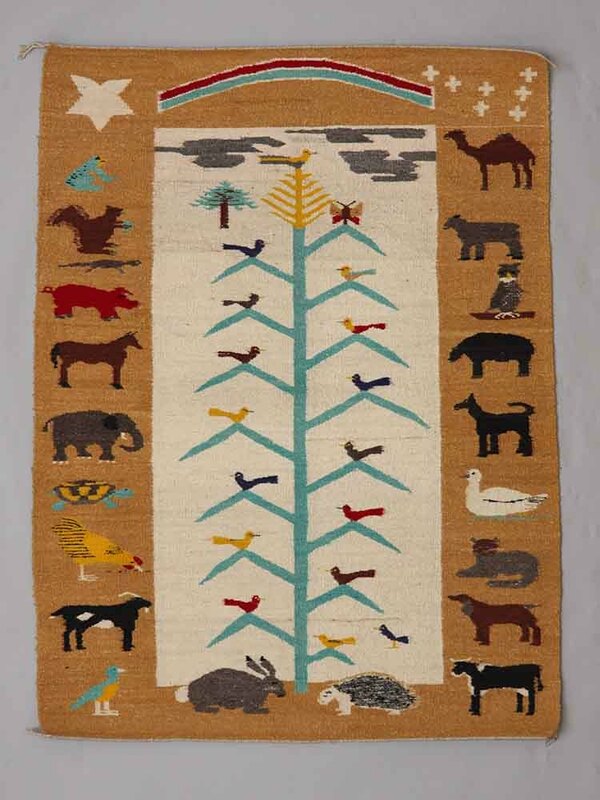 But, before, you embark on this Short Course in Navajo Rug Types, constantly bear in mind, the disconcerting fact that sometimes–though, blessedly, rarely–someone will put up a Cape Cod style house in Southern California. Beginning in the Northeast corner of the Reservation, the first rug to be studied here is the Shiprock-Red Rocks type. Shiprock, that massive volcanic plug around which this weaving type centers, is one of the Southwest’s most famous landmarks. The San Juan River, a migrant desert stream, cuts through this valley on its west-bound course to the Colorado River. 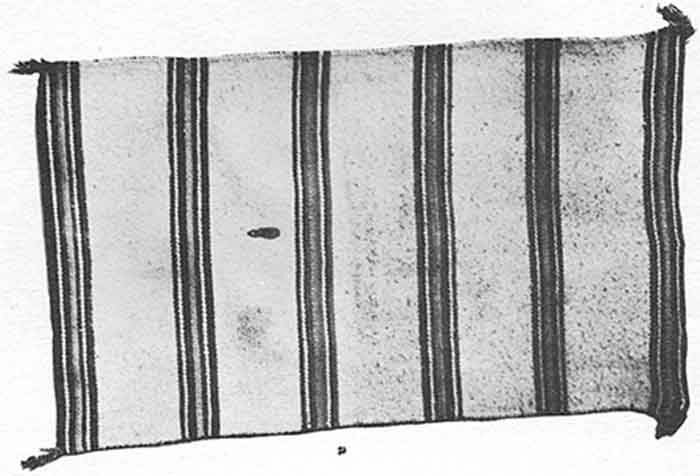 In the early part of this century, the so-called Yei Blanket was commercially developed by Will Evans, one-time trader-owner of the Shiprock Trading Company. The Yei is a religious figure taken from the highly stylized sandpaintings, and is their actual representation of these super-natural beings. But, while this blanket’s central design is depicted in healing rites and designs reverently made by Medicine Men, the typical Yei Blanket itself has no religious significance. as many as 15 shades and hues. 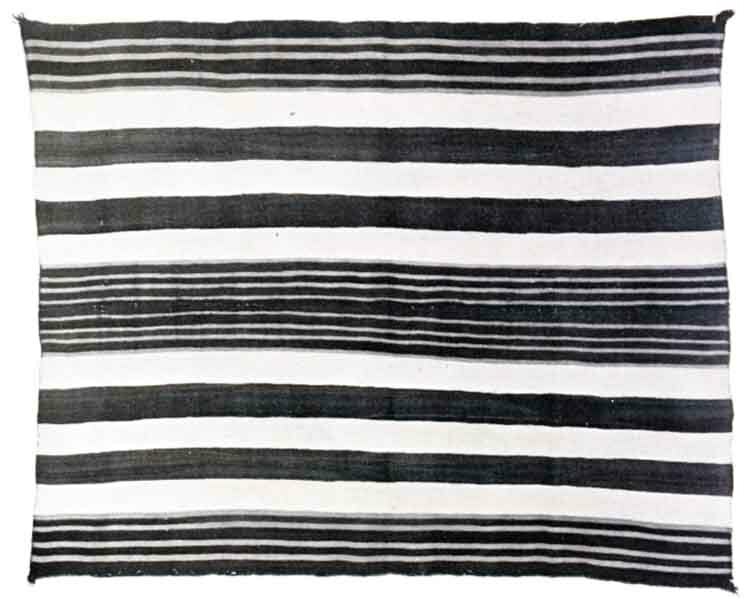 In addition to their brightly costumed slender figures on white backgrounds, the typical Yei blanket has a third characteristic: a stylized rainbow figure woven down its two sides and across the bottom. A Yei usually tends to be on the small size. In fact, a 3 x 5 Yei is considered a big rug. I think the subject matter, which lends itself to a wall-hanging type of tapestry, dictates, in turn, the relatively small size of this rug. Rarely will the average home take an oil painting larger than 3 x 5 feet in size, and in the best sense of the word, a good Yei is a fine painting. is without one. As a rule, the Yeibichai is a more expensive rug. West of the Lukachukai Mountains lies the triangle of trading posts–Upper Greasewood, Round Rock and Lukachukai– that deal with a unique rug type bearing the latter post’s name. From over the mountains came the Yei design, but if the Shiprock-Red Rocks Yei tapestry is a fine portrait suitable for wall display, the Lukachukai Yei is quite content to take its place on the floor. In fact, the Lu- kachukai Yei is a rather heavy floor rug, for only handspun wool goes into its production. The coarse floor Yeis are also stylized representations of Yei figures, but these Yeis, not as fussy as their Shiprock relations, repose on gray, red or black backgrounds as well as on white. There seems to be no reluctance on the part of the weaver to hold back on the reds when it comes to choosing a color for the Yeis themselves. The usual size for a Lukachukai Yei is from ‘3 x 5’ to ‘4 x 6’ feet. Occasionally a weaver will try for some sort of local record, and a large rug will emerge. I have seen Lukachukai Yeis 8 x 10 feet in size, which means the Yei figures are tall as men. The weavers in this area also make good aniline dye rugs in the regular patterns in red, gray, black and white. West of Shiprock, near the common boundary point of Arizona, New Mexico, Colorado and Utah, is Teec Nos Pos (Circle of Cottonwood Trees). Today, a paved road links this post with the outside world, but it has been only a matter of months since the dusty, bumpy journey to Teec Nos Pos was an adventure merit- ing the most serious preparation. Actually there are two main posts in the weaving area at the North End of the Carrizo Mountains: Teec Nos Pos itself, and Beclabito (Water Under a Ledge). 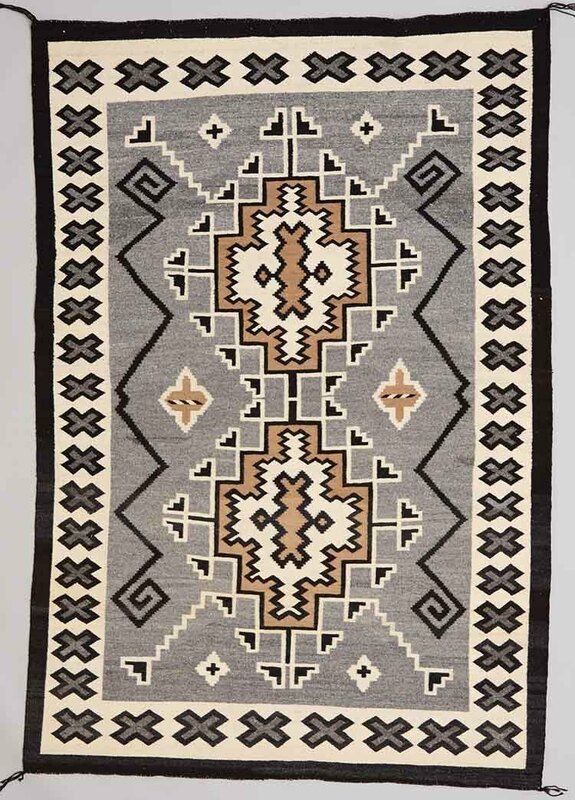 The Teec Nos Pos rug is at once the most distinctive and least “Navajo” of all the Reservation’s special- ized textile types. It is also the hardest rug to place in a home–not because of its non-Indian characteristic, but because of its complexity of design and abundance and variety of color are hard to fit into the average home’s decoration scheme. The Teec Nos Pos reserves its greatest appeal for the serious collector. The distinctive rug from Teec Nos Pos features an outline design. That is, every band, diamond, bar, stripe, square or slash is outlined in one or more different colors and the design areas are filled with color. Characteristically, these rugs are very “busy”. The main theme is usually a serrated zig zag. (Photo 22). Some of nature’s rainbows would be hard-pressed to show the colors of a Teec Nos Pos Outline: the more common reds, blacks, whites and grays are joined in unabashed concert with yellows, greens, purples, oranges and florescent pinks. West and slightly North of Teec Nos Pos, hard against the Utah border, are a trio of trading posts–Red Mesa, Sweetwater and Mexican Water–where a group of weavers are producing distinctive rugs. Usually made of handspun yarn, the Red Mesa area rugs have a coarse finish, but are of good quality. The geomet- ric patterns are done in the traditional reds, grays, blacks, and whites–but here and there in a rug will be a bar of blue or a slash of green, or both. 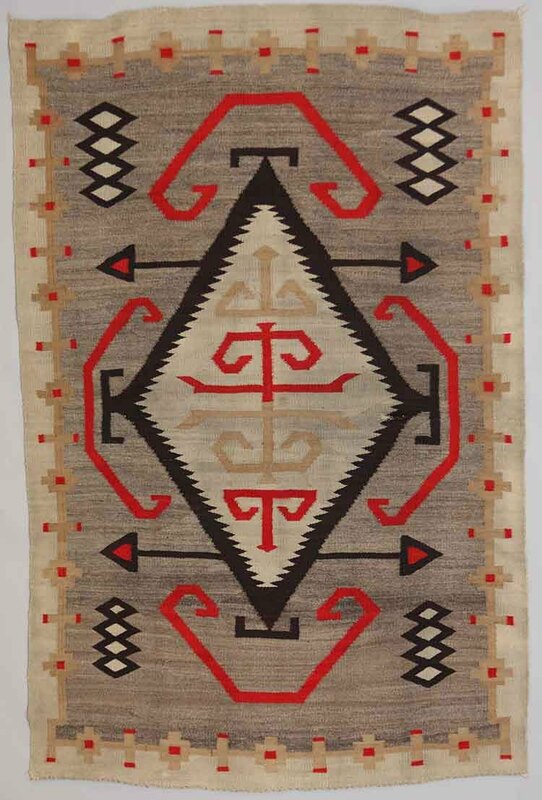 Some of these weavers outline their designs in the tradition of the Teec Nos Pos, but the Red Mesa rugs lack the gaudy colors of the Teec Nos Pos rugs (Photo 23). The sizes vary from 3 x 5 to 8 x 10 feet. Square foot for square foot, the Two Grey Hills is the finest rug that has come–and continues to come–from the post-Classic Navajo loom.The Two Grey Hills post, along with the neighboring posts of Brinks (at Newcomb) and Toadlena (which means “water bubbling out of the ground”), are west of U.S. Highway 666 midway between Shiprock and Gallup. Toadlena is at the foot of the Chuska Moun- tains; Two Grey Hills is on the plain, and Brinks is on the highway. Two competing traders, George Bloomfield and Ed Davies, deserve the credit for the eminence enjoyed by the Two Grey Hills–the Aristocrat of Navajo Rugs. Davies, an Englishman, arrived on the scene at Two Grey Hills in 1909. Soon after, Bloomfield, a devout Mormon, set up shop at Toadlena, a scant five miles from Two Grey Hills. The two men soon became fast friends. Before the arrival of Davies and Bloomfield, the Two Grey Hills rug was of ordinary quality and undis- tinguished design. In the space of 15 years, Two Grey Hills was the best as far as fine spun yarn is con- cerned, and it had never been topped in this.These two dedicated traders achieved this by long, patient hours on their knees–not praying–but going over every stitch of rug with its weaver, complimenting the fine points, kindly urging improvement where improvement was called for. Two Grey Hills was the best as far as fine spun yarn is concerned, and it had never been topped in this. What did they build on? A rug woven of natural color blacks, whites, grays and shades of browns–still the distinguishing colors of the Two Grey Hills rugs. For gray, the black and white are carded together; for tan, brown and white are blended. The traders learned early that the Navajos in the Two Grey Hills area–unlike all other Navajos in this respect–have no affection for the color red, either in their dress or in their rugs. The basic Two Grey Hills pattern remains unchanged: geometric designs (Photo 12). There is common belief that the old type Crystal Area rug weaver’s designs filtered over the mountains to influence the Two Grey Hills craftswom- en, but the evidence for this is far from conclusive. While Davies and Bloomfield had success in obtaining high standards at Two Gray Hills, it should be point- ed out that their achievement was not without precedent. South and West of Two Grey Hills and beyond Washington Pass is the post of Crystal, New Mexico where J.B. Moore held sway from 1896 to 1911. The early Crystals were 20 percent Navajo design and 80 percent Moore’s conception of what the Navajo design should be to be saleable. He did not hesitate to draw from his own imagination when other sources were dried up. These rugs had borders, crosses, diamonds and a characteristic hook figure somewhat resembling the letter “G” lying on its side (Photo 24). The weavers knew a good thing, and they hewed to the Moore line, turning out rug after rug in the handsome Crystal mode. Red is much in evidence, along with the natural blacks, white, grays and browns, in the Moore-period Crystals. While there was definite improvement in design and color scheme the early Crystal was a good seller because the trader insisted on good weaving with clean, well-spun wool. After Moore took his leave of the Reservation, the quality and distinctiveness of the Crystal rug followed hard on his heels. By the time the Two Grey Hills rug was coming into flower, the classic Crystal was dead.Yet, out of the ashes emerged a new Crystal type, dating from the 1940s. This rug is as serviceable and distinctive as its predecessor, but today’s Crystal departs radically in two important respects. The modern Crystal features vegetal dyes (of which more later) –rich tawny colors in the brown-yellow- tan-orange range–with a touch of black and subtle green. Sometimes aniline dyes are used in combination with these vegetal dyes. 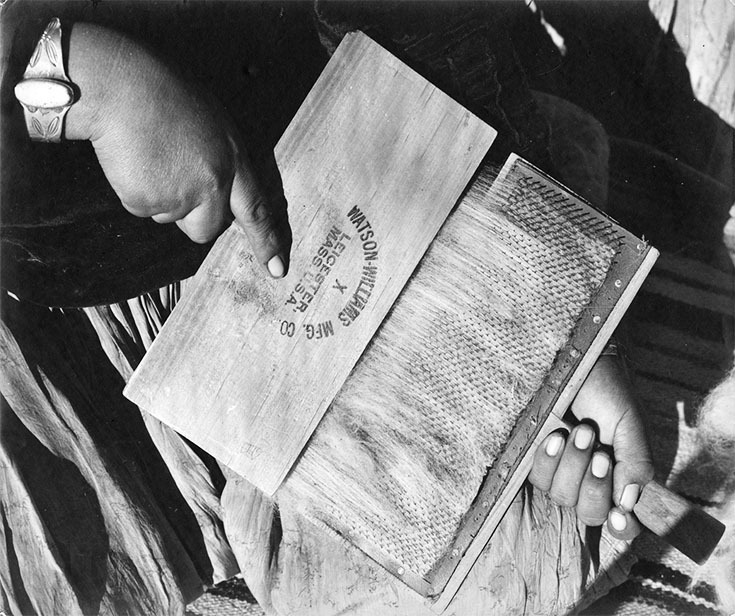 Master weaver Desbah Nez was the first woman at Crystal to use vegetal dyes– this, around 1940. The second difference is in design. Today, Crystal is banded–either in straight or wavy lines. 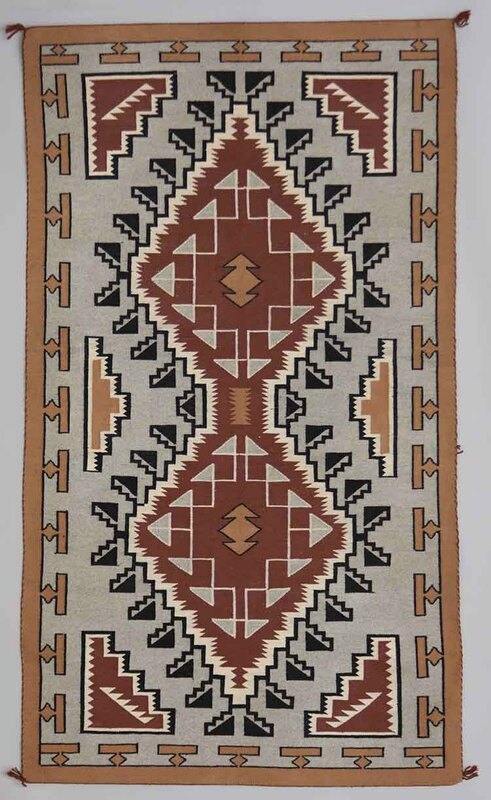 This is a sharp departure from the old style rugs produced here, and it can be stated without equivo- cation that the modern Crystal is the most simple of all the Navajo contemporary design types (Photo 25). Handspun yarns are used, even today, in this weaving center, which means a modern Crystal tends to be on the heavy side, thus making it particularly well suited for floor duty. 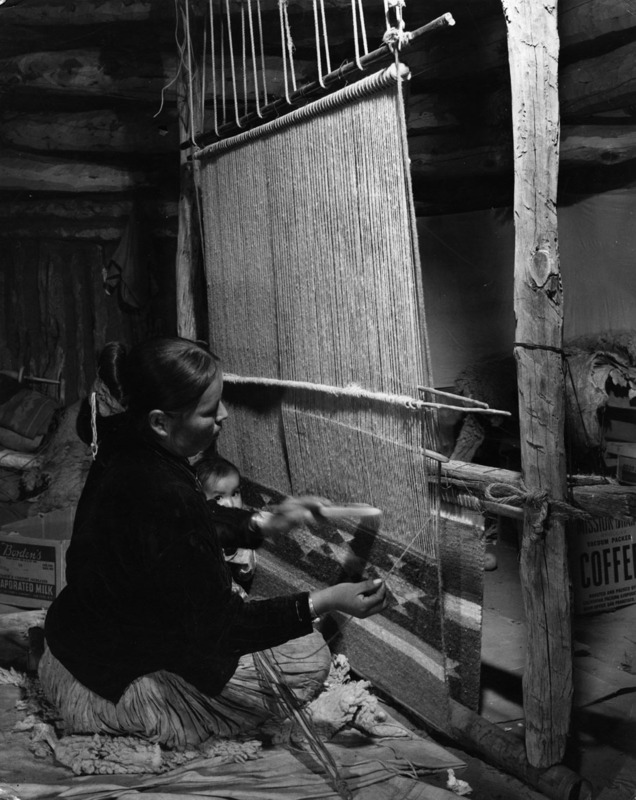 Two things go into all Navajo rugs: wool and work. A third ingredient, dye, is optional. Wool, of course, is the chief raw material. If the weaver chooses machine-spun yarn, then her source of supply would be no different than yours: a store. If the weaver uses hand-spun wool, then her source of supply is on the hoof right outside her hogan door. The long-fibered wool shorn from the back of sheep is usually earmarked for a rug. (The remaining shorter, fibered wool is bagged and sold at the trading post.) The shorn wool is hand-cleaned of burrs and other debris. Then it is washed and dried in the sun. Carding, with what looks like a pair of curry combs, leaves the wool in long, loose, fluffy rolls. A handful of wool is placed on one of the toothed surfaced carders, and the other is raked across it until the wool fibers are untangled and tend to have a uniform trend in the rolls. It is this hand carding that gives the final product its remarkable strength and wear- ability for the individual fibers are less apt to be broken when worked by hand. Next step-the most important-is to spin the carded wool into threads. The familiar spinning wheel was never used in Navajoland. Instead, a light hand spindle is used. These devices, which somewhat resem- ble a miniature ski pole or a long-shafted top, have decided advantages over the spinning wheel. 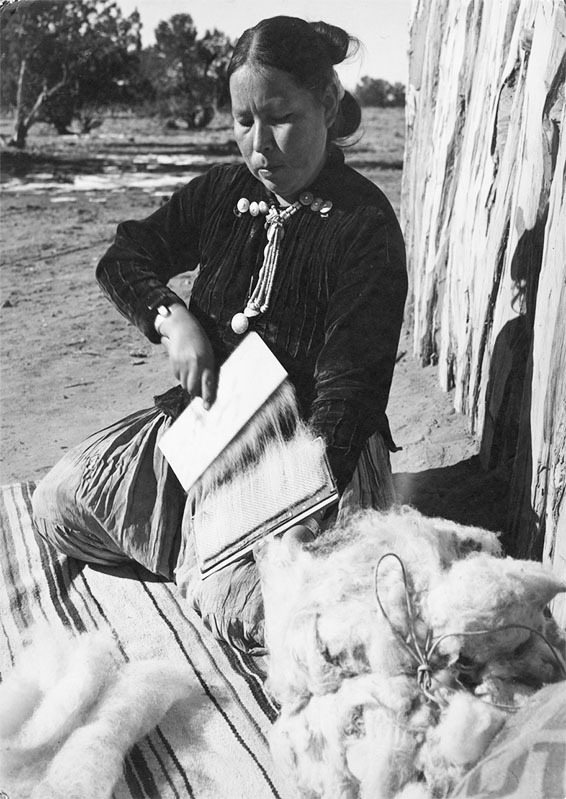 For one thing, the semi-nomadic Indians must travel light; for another, a hand spindle allows the weaver latitude in when and where she can work –while tending the flock, seated in the shade of a tree, gossiping with visiting relatives, in the hogan, in town while her husband is getting a tire fixed. The spindle is manipulated with the right hand; the wool with the left. A strip of carded wool is twisted around the top of the spindle; then a twirl of the spindle combined with a tug on the end of the starter thread causes the line of yarn to grow in length. Twirl, stretch, jerk, twirl, stretch, jerk-over and over the process is repeated, adding more rolls of carded wool until all of the wool is twisted into thread. More wool is used in the first spinning to make it heavier and coarser for the warp. Additional spinning, pulling and twisting the original yarn into finer and finer thread, is used for the weft. An interesting sidelight: because the yarn is held in the left hand, the Navajo home-spun has a left- hand twist. Pueblo yarn and practically all machine-made yarns have a right-handed twist. If the yarn is to be dyed, that process takes place after the spinning. 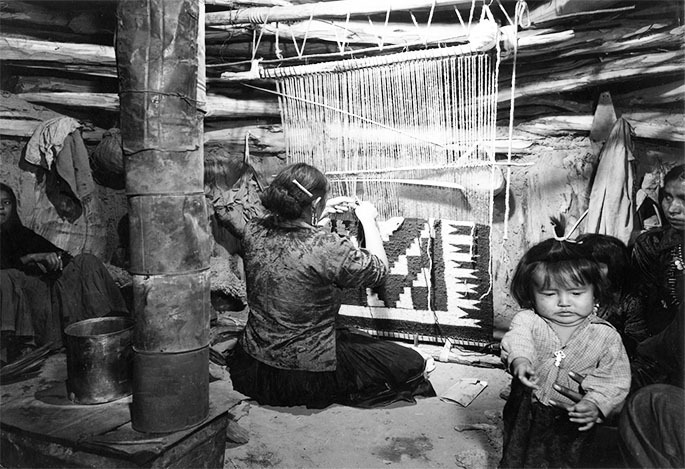 No modern innovations appear in the Navajo vertical loom. The frame and all other parts are used as long as they serve their intended function –some looms have been used for generations. Navajos, as all good craftsmen, hate to sell the tools they have become accustomed to using, no matter how simple. New tools are made for sale, as are sample looms– set up and bearing partially woven rugs. The first yarn to be placed on the loom is the warp thread; this is strung between the upper and lower loom bars, the down-thread crossing behind one or the other of the bars, the up-thread running opposite, so that the closely placed threads form a figure eight crossing the middle. After the warps are strung, strong border cords –top and bottom– are woven into place. These serve primarily to keep the warp threads separated and in place. The weaver of a simple, over-and-under tapestry weave rug will use two heddle rods: one tied to alternating warp threads, the other –a loose untied heddle– is inserted be- tween the other warp threads. This latter heddle is used to pull forward the even warp threads. Thus by pulling one heddle, all even numbered warps are brought forward and separated from the odd numbered ones. Theses threads are held apart by insertion of a batten (an 18 to 24 inch flat wood piece). Between the sheds thus created, the weft threads are combed into place with a wooden toothed comb, then tamped down into place with a batten. Weaving a rug –as you can see– can be a lot of work. 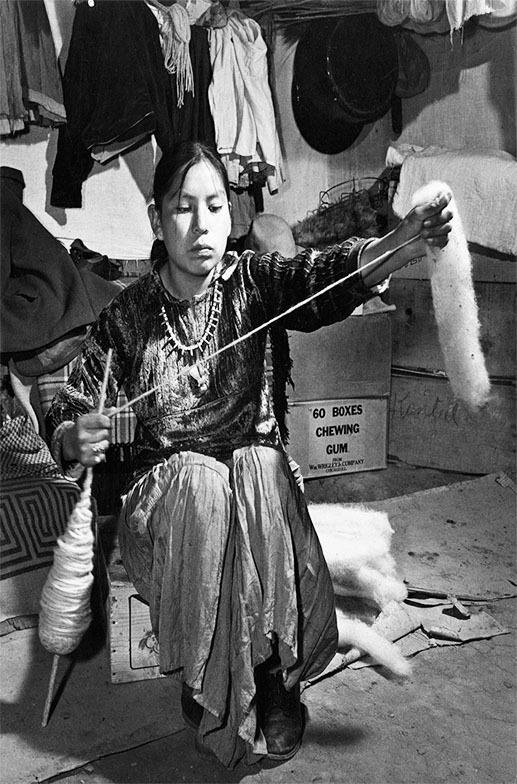 From time to time we hear reports that a Navajo weaver is poorly paid, maybe an average of 5 cents or so an hour, for her la- bor. Unfortunately, there is much truth to this, but it should be pointed out that rug weaving is a spare-time avocation. A dealer friend of mine once placed an expert Navajo weaver on his payroll as $1 an hour. For her he bought hand-spun vegetal dye yarns. He told the woman to do two pieces of weaving: a better than average, twill weave, double saddle blanket (30 x 60 inches), and a 3 x 5 foot quality rug. 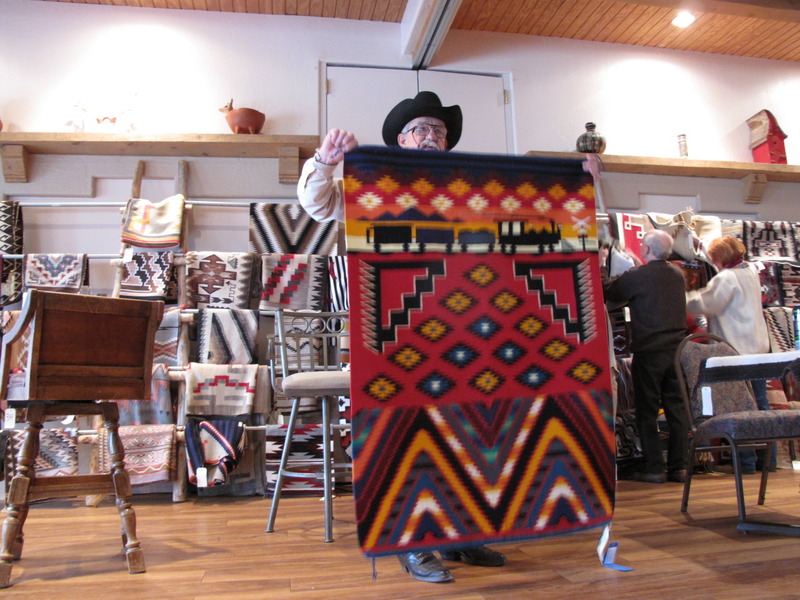 The saddle blanket was completed in 140 hours, the rug in 238 hours! Andthis, I would remind you was straight weaving time –not spare time. If this weaver had shorn, washed, carded, spun and dyed her own wool, my friend conservatively estimates that it would have taken another 200 hours. You should be prepared to pay more for quality weaving- but in the long run, you will not regret it. A rug is meant to be utilitarian –it is not a curio. Navajo rugs are one of a kind. If you like a rug and the price is right –buy it. Don’t depend on the rug waiting for your return. Rug turnover is great in most retail outlets. Maxwell, Gilbert S. (1963). Navajo Rugs: past, present & future. Desert Southwest Inc.